Buzz Words: Where's My Potty? This simply-worded picture book about a baby gorilla looking for his potty is an in-house offering and debut book for illustrator Felicity Gardner. Max isn't the only one in potty training but he discovers that all potties are not the same size or easy to access. The baby hippo's potty is in far too wet a spot for a gorilla to use. And how could Max possibly reach the baby giraffe's commode or sit on the potty of a baby bird? Max's bottom was far too big. Max searches on, his toilet roll getting more and more entangled in branches and tree trunks and several other things. He really needs to go! He likes the one the flamingos are crowding around, but how could anyone do a number two in front of a large audience? Fortunately, Max finds his potty and his anxious expression is replaced with one of relief. 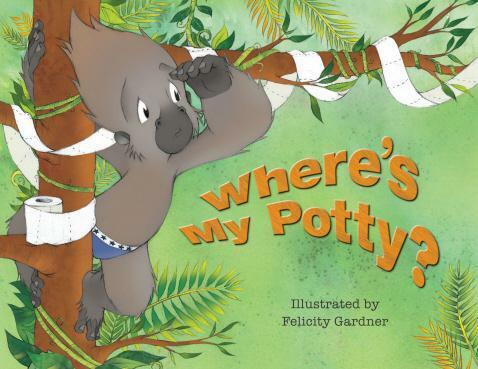 The cute jungle animals and humorous storyline will particularly entertain toddlers in the process of potty training. The rows of colourful underpants on the inside cover pages are topical and fun. Labels: Felicity Gardiner, Lothian/Hachette, picture book, Where's My Potty?